We take a look at the Falcon Heavy’s first commercial mission, and take a peek inside SpaceX’s core technologies that are making spaceflight affordable. SpaceX has marked a new high in the saga of affordable space missions, managing to land all three of the SpaceX Falcon Heavy boosters at its first ever commercial mission. The triple landing is a remarkable feat, since it requires unerring precision to safely send rockets up to space on an orbital mission, and subsequently land them back on Earth. The incident prompted Elon Musk to state that the Falcon Heavy, which is believed to be the most powerful spaceflight rocket on Earth right now, will be good enough to execute at least 10 space missions before needing any major reinforcements. Being a remarkable feat in the advancement of science and technology, SpaceX’s reusable heavy rocket configuration might actually change the way mankind approaches space missions, not only making them more affordable, but also significantly more viable in the face of rising fuel prices. Here’s looking at the key points from the first commercial mission of the SpaceX Falcon Heavy, and how its first actual mission panned out. The first ever commercially operational mission for the SpaceX Falcon Heavy was undertaken earlier today, at 3:35am IST on April 12 (6:25pm EST on April 11). It took off from the iconic Launch Pad 39A at the NASA Kennedy Space Centre in Florida, USA. Adding even more significance to the mission, the Launch Pad 39A is now famous for being the same pad that was used by NASA during its Apollo moon missions back in the 1960s and ‘70s, thereby lending a rather poetic ring to SpaceX’s first practical proof of its technological advancement. The payload involved was the Arabsat-6A, a communications satellite built by Lockheed Martin for the Arabian telecommunications company, and is aimed at beaming internet, television and radio connectivity across the Middle East, Africa and Eastern Europe. To emphasise on the importance of the mission, Lockheed Martin’s contract with Arabsat for a batch of satellite launches stands at $650 million, and uses some of the best technologies to become one of the most sophisticated communications satellites that are orbiting the Earth at this very moment. Interestingly, the Falcon Heavy was picked by Arabsat as the ferrier of the satellite back in 2015, when its deal with Lockheed Martin was announced. Back then, the flagship rocket configuration of SpaceX, which also happens to be the world’s heaviest and most powerful flying object, was not tested as yet, and marked a rather ambitious project. CEO Musk had also warned viewers and interested parties that the first launch of the Falcon Heavy may not quite go as per schedule, and the rocket might explode upon landing. The first major commercial testing of the Falcon Heavy happened in February 2018, when Musk sent his own cherry red Tesla Roadster into orbit as part of the Falcon Heavy’s dummy payload in its first test flight. Priced at $91 million, the SpaceX Falcon Heavy is the world’s most powerful rocket, and yet, is priced at only a third of what its competitors cost. The same, however, cannot be said of its first commercial payload that was deployed, which was definitely more valuable (at least economically) than Starman seated in the Roadster. 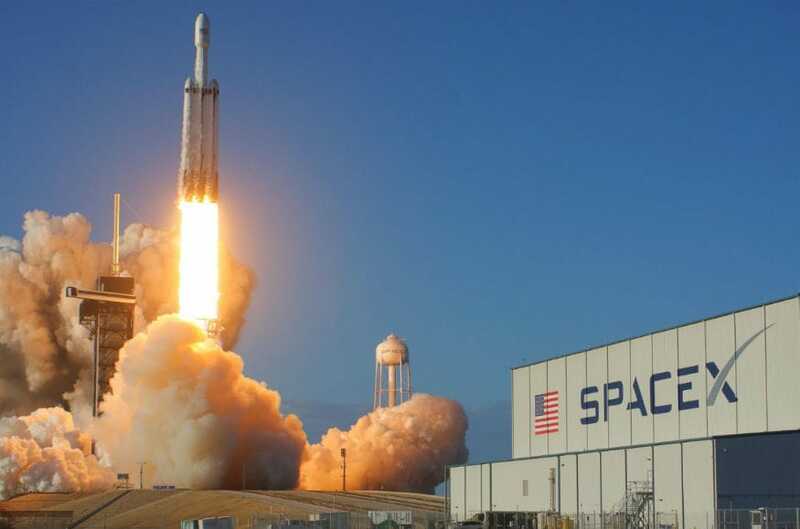 The SpaceX Falcon Heavy is officially classified as an orbital heavy lift launch vehicle, which will specialise in mass satellite launches and deployments in orbit, while being reusable in nature. This makes it extremely cost effective in nature, which maximising the profit potentials for SpaceX. In terms of configuration, the Falcon Heavy is based on the standard Falcon 9 first stage rocket, but is increased in launch power. In order to increase its lift thrust, the Falcon Heavy further deploys two more Falcon 9 first stage rockets alongside it. In typical configuration, the three first-stage, 27-engine rocket lifts off in the combined form, and once beyond the atmosphere, the two accompanying first stages are typically detached and brought back to earth. 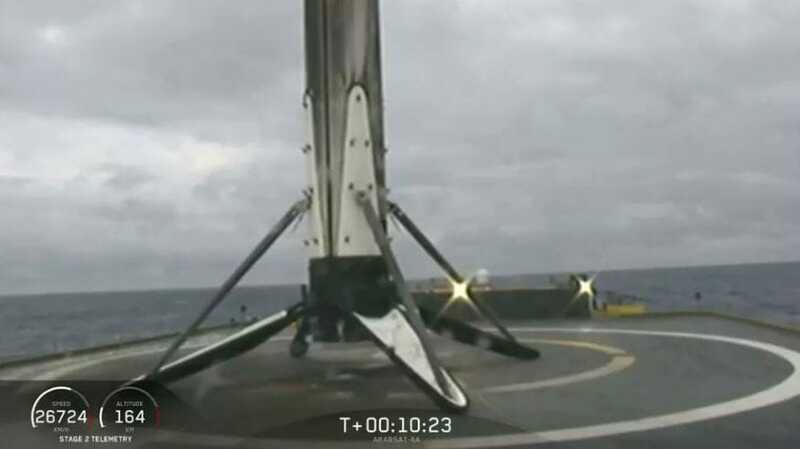 In its bid to improve spaceflight efficiency and reduce costs, SpaceX was so far able to land back the two first stage boosters, but had failed to retrieve the main booster, which then missed its mid-ocean landing pad and splashed into the sea. In this present mission, the Falcon Heavy received upgrades in the form of Block-5 component rockets. For those who have not been following SpaceX’s falconry, the Block-5 component rocket is the final piece of the jigsaw for Musk’s reusable rocket puzzle, having premiered in May 2018 in the lighter Falcon 9. It is the culmination of over a decade of development, in the quest to build the perfect, turbocharged, durable rocket which can be reused multiple times without needing any major engineering action. It is this that will help SpaceX achieve the target of turning spaceflight into something similar to mainstream commercial aviation that we see today. In terms of technology, the very core of the Block-5 consists of a largely improved engine, which delivers higher power and thrust figures at higher efficiency. 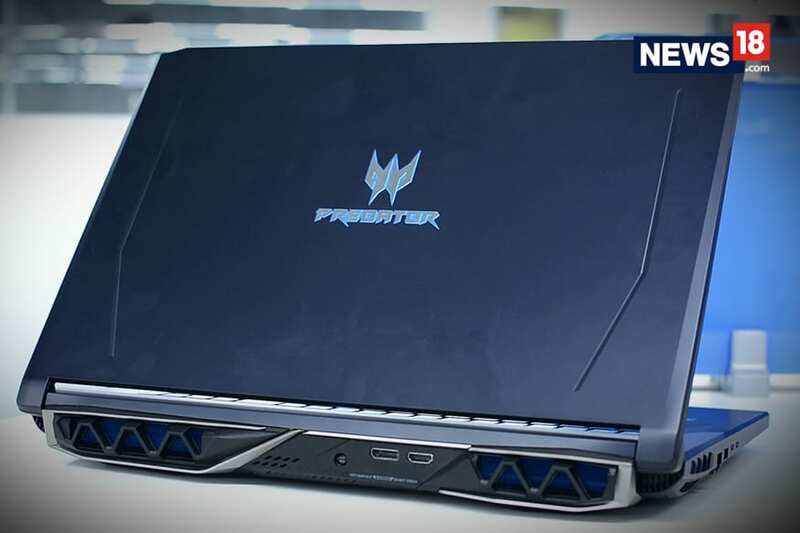 It also gets titanium-grade fins, a more durable interstage that makes the two-stage rocket shift smoother and more efficient, and even gets a new thermal protection system that will help it deal with launch stresses better. This will be one key piece of innovation that improves the reusability factor, the first run of which happened in today’s launch of the Falcon Heavy. For instance, today’s launch had over 5,000lbs of thrust, a significantly improved figure over the previous Falcon boosters. The rest of the configuration remained the same, and while the first two booster stages steadily landed back on solid ground, the core stage of the Falcon Heavy aimed for the mid-ocean SpaceX landing pad ship, which has now become a bit of a cult icon — ‘Of Course I Still Love You’. This time ‘round, the Falcon Heavy’s core stage aimed for the landing pad, and all three of its engines fired properly, hence bringing it back to Earth in one piece, rounding up an incredible feat that overshadowed the deployment of an important, (very) expensive and consequential satellite in low earth orbit. What makes today so special in the history of spaceflight is that for the first time, SpaceX has succeeded in making all three of its first stages, including the core stage, to land back on earth, displaying full reusability. This drastically changes the model in which spaceflight has operated so far — even the United Launch Alliance’s Delta IV Heavy does not match up to the cost-utility ratio that the Falcon Heavy is drawing. For reference, if Musk’s claim of at least 10 space deployment runs hold up, the Falcon Heavy will not only set a record, but stitch together a new paradigm of rocket engineering that has not been seen before. The second, more emotional development is that SpaceX itself is already developing a larger, heavier and better rocket that will be capable of even greater reusability in future. As a result, the Falcon Heavy is possibly set to become part of iconic pop culture, in a way that it will have shaped the path for easier travel into space. Think of this as a bit like the Boeing 747, which with its wide fuselage and pace-setting safety became a commercial airspace icon, ever since being launched half a century ago. The SpaceX Falcon Heavy will soon be setting itself up for more missions, and is expected to take off next with a ‘space test programme’ for the United States Air Force. Here’s wishing it many more successful runs and reruns, and who knows, maybe even a chance meeting with Starman in his glitzy ol’ Roadster.